Who say's San Luis Obispo is the best place to live? Well, let's see... Oprah, Dateline NBC, Sunset Magazine, ABC News, Men's Journal, LA Times and National Geographic just to name a few! I can confirm the rumors because I live and work here. San Luis Obispo County is a coastal county located between San Francisco and Los Angeles… Our main city is also San Luis Obispo (or "SLO" as locals call it) and I'm sure you've been hearing about it! Oprah called San Luis Obispo the "Happiest place in America" to live! It's been voted by Sunset magazine as the Best Town of the Future, having the Best Weather in the US, the most irresistible Wine Escapes in the country and Best Foods and Farmer's Markets! What makes SLO so magical? Often people say it's the ideal weather and clean air. Other's say it's unmatched community spirit, non-profit support and entrepreneurial leadership. Visitor's might argue that it's the natural and assorted beauty from inland to the sea. Perhaps it the unique wildlife and migrating friends that make us unique. Maybe the celebrations of our history makes it a magical place to be. Personally, I enjoy the variety of activities across this relaxed county! The celebrated public events certainly add a lot of character and fun for all ages... But maybe it's the range of award winning foods or the world class wineries that make SLO county so special. Living here and escaping to the variety of beaches certainly has it's perks but maybe it's the happy people that make SLO such a great place to live! * Forbes predicted us as the "Best City for Housing Recovery"
* Delta Sky Magazine calls us the "Happiest Place in the World"
* Men's Journal calls us the "Coolest Town"
* MSN reported us as the "Best College Town"
* Dateline NBC picked SLO as a "Top Place in the WORLD to Live"
Have you figured out the magic word that makes SLO so desirable? It's the lifestyle. Living here is easy. Finding the perfect home should be too. If you want a piece of this paradise, it's as easy as calling San Luis Obispo's expert in homes. 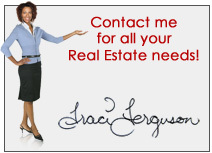 Traci Ferguson and her associates are hear to answer any of your Real Estate questions. On your next visit to San Luis Obispo, give us a call and let us help you. Enjoy this walk down memory lane, circa 1949 in San Luis Obispo! It was wonderful then and has only gotten better!